It is used to show that a work is being done for a time. It is still being done now also. It may be continuing for a particular duration or from a point of time i.e. for two hours or since morning. With time words ‘for or since’ are generally used. Has or Have with been and first form of verb and -ing is used in these sentences. You have been working since morning. 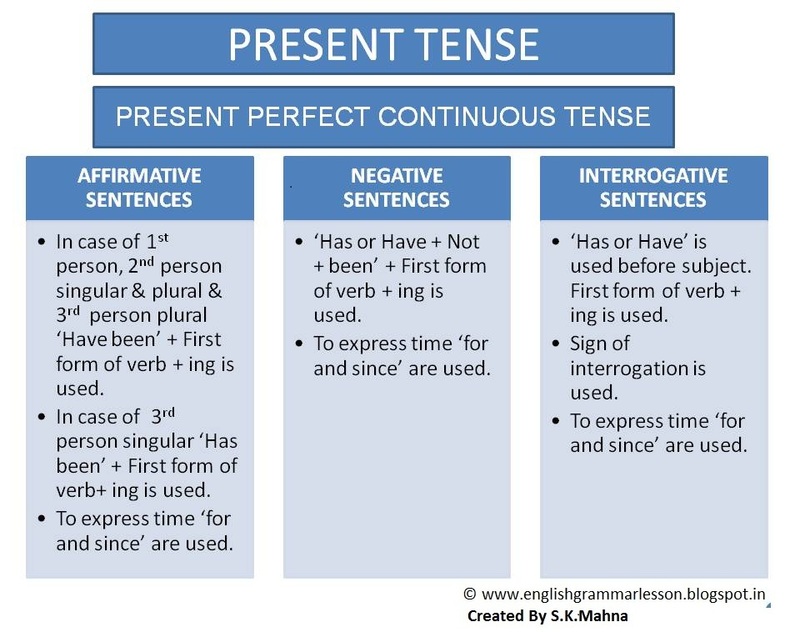 With First person, Second person singular and plural and third person plural ‘have’ is used with ‘been’ and first form of verb and ‘ing’ is used. With third person singular ‘has’ is used with ‘been’ and first form of verb and ‘ing’ is used. To depict time since or for is used. I have been waiting for you for one hour. You have been preparing for your examination for the last two months. She has been working in this office for two years. In negative sentences has have been and not is used with first form of verb and ing. I have not been working since morning. She has not been dancing for two hours. You have not been watching T.V. for half an hour. Children have not been shouting for an hour. In Interrogative sentences Has Have is used before Subject. Has he been waiting for you for two hours? Have you been playing since morning? Have children been doing their work for two hours ? Have we been living here for the last two years? Similarly in interrogative negative sentences Has Have is used before subject and not is used before first form of verb with ing in the sentence. Has she not been singing for two hours ? Have the boys not been playing a match since morning? Has she not been cooking food since 2 P.M. ? Have you not been accompanying him for two days?